DO YOU KNOW WHAT THIS IS?!?! Well, maybe not, but my brother sure does, dear thing that he is. When I was down in Texas last, mom let us pick through the children's books that we had growing up to divide them up. Christopher and I agreed to each take turns picking titles. He would pick one and then I would pick one and then he would pick one and so on and so forth. Now, I would just like to take a moment to point out that even though *I* was the one who discovered that the Hank the Cowdog books were actually BEHIND the first row of books and split the loot in my brother's favor, he was not so kind to me when it came to Ed Emberley's thumb print drawing book that we had growing up. Oh no. Instead of magnanomously handing it over to the older sister, he laughed in my face. IN MY FACE, PEOPLE! How cruel. How horribly uncooth. How UNKIND! And him in seminary! Psssh. Not wanting to hold the grudge against him, I let it go realizing his claiming of the book was fair according to our rules. (Although not before howling for my mother to come into the room and note my displeasure.) I flew away empty handed on this point. However, all is redeemed and well! I walked into our local Borders and lo and behold -- Ed Emberley's Complete Funprint Drawing Book . With wild glee I pounced upon it! Not only does it contain all of the thumbprint artwork drawings from my our book growing up, but it also includes the "GREAT Thumbprint Drawing Books." It's a DELUXE EDITION! We've got more than the holidays in here, folks. We have fingerprint mermaids and owls and trains and fun dragons too. Oh yes. I HAVE WON! In the end, sacrificing the first book (against my will) turned into my great pleasure. Except. Well. There IS something to having THE actual book that you used growing up. There's the nostalgia...the familiar pages....the favorite thumbprint people you knew and loved....the memories of doing it with your sibling. Oh well. I am glad for the sake of my nieces and nephews that they will own such a treasure. We, up in Oregon, will make do with the modern edition and then our children can compete to see who can make the best Thumbprint Christmas cards. I love that you whined (?) to your mom! :) We have two of Ed Emberley's books though they arent' the thumbprint ones. Ben seems more attracted to the Draw.Write.Now series though. BWAHAHAH!!! I love that you whined to your mum. There is something special about the books you had when you grow up. I really should make sure I lay claim to some of my favourites. What a fun story! Our N1 LOVES these books and we have 3-4 of them. They are great for her. my mom saved all the coloring books that had any blank pages left, it is quite a treat to look through them with my kids. They love seeing the pages that my brother or I did. I have a My Little Pony that I am saving to finish off with Ziva when she is a bit older. Those childhood books are so special and irreplaceable, and it's wonderful to share them with the kids in our lives. 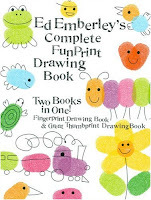 I didn't have this Emberley book growing up, but oh, I was so in love with Emberley's Draw the World book. I didn't have my own copy so I would borrow the library's copy over and over again. Last year, I bought my own copy. My youngest (who's now six) and I spend loads of time drawing Ed Emberley worlds! I just discovered EE recently and I am so glad for my littl ones' sake. I already love them and so do they! But I will have to look for the deluxe edition! I really, really enjoy your reviews!